When our Publisher decided to bring an assistant publisher on board, he chose someone who had a plethora of publishing and web experience, but who had very little Montana experience. So one of the first things we did was ride together on a delivery mission to Glacier National Park. Not far outside of East Glacier we drove into a little guest ranch. Once we’d made our delivery we quickly understood why the horses were milling around on the lane and in the yard, instead of inside the pasture ringed by electric fence. A cow moose walked along the electric fence with her newborn, wobbly legged twin calves. The moose family offered a unique photo opportunity as they walked along the fence. We enjoyed driving alongside them for a bit, observing them from a safe distance as the lane followed the pasture border. The wobbly calves tottered and wobbled their way along, doing their best to keep up with their mother. Our study of the little family soon came to an end. The lane curved on its way out to the highway. As we went around the curve the fence came across, perpendicular to the moose’s path. So we stopped the van, feeling pretty safe due to the fence between us and the cow. As we snapped our last photo through the side window, mama moose decided the photo shoot was over. We imagine she felt that our vehicle threatened her calves. She charged the van. 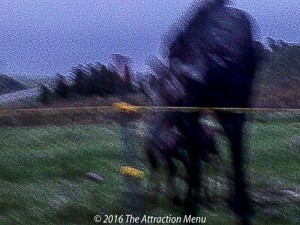 The blurry image below is evidence that at the moment our finger pressed the shutter, the moose was already in motion. Never put yourself in the path of a moose! This moose would have been in our van if not for the electric fence in her path. Believe us when we say that a moose can go from zero to 60 in nothing flat! For a long moment, it seemed the moose would come over the fence, and at the very least strike the van. The new Montanan thought for sure the moose was coming right through the open window and into the van. She shrieked loudly. 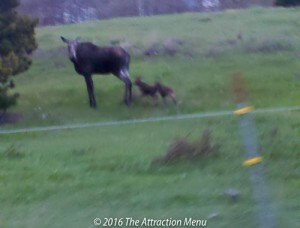 At that instant, the moose’s nose came into contact with the electric fence, and she backed off and switched directions. Her calves wobbling after her. We high-tailed out to the highway and left mother moose to her business. We had a good laugh over the loud noise emitted by the new Montanan. And we still laugh about it. But we don’t laugh about stopping in the direct path of a moose. If there hadn’t been an electric fence to deter her, the end of this story wouldn’t have been very amusing. We’ll remember this adage: don’t mess with mother moose!